A dog came to its owner's rescue after she was grabbed from behind by a stranger, who tried to drag her into some bushes in South Yorkshire. 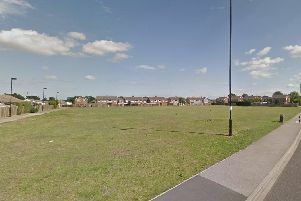 The 21-year-old victim was walking the heroic hound along a ginnel in Doncaster when a man reportedly approached from behind and grabbed her. He is said to have dragged her towards some bushes before the pooch bit him and chased him away. Police investigating the assault, which is alleged to have taken place on St Peter's Road in Balby, at the side of Hexthorpe fields, on Sunday, July 29, at around 10.30pm, today released this e-fit of a man they are seeking to identify. Detective Constable Jill Rankin said: "Thankfully, the woman was not seriously injured. However, this incident was understandably incredibly traumatic for her. "We've since worked with her to produce this e-fit image of a man we need your help to identify. Do you recognise him or know who he could be?